Naturist Times, Issue #0030 -- Bits and Pieces! We are just reaching the end of our annual stint in Cornwall when we catch up with family and friends (and Jan does some teaching). Back to France soon and the normality of Jan massaging at the local residential yoga centre (definitely worth considering if you practice yoga (get in touch with us for details)), and Rog writing the Naturist Holiday Guide and working on the house. During our stay in Cornwall we have been absolutely hammered by the weather which is why we have decided to feature swimming pools in this newsletter. We certainly intend visiting a few this summer! Picture seventy acres of secluded naturist heaven. You have Finca Natura, an adult only resort in Southern Spain about forty minutes from Malaga airport, close to the Moorish town of Alora. The resort can only be described as stunning with lemon, orange, olive and almond trees dotted around the surrounding hills. Finca Natura accommodates six adults in three apartments. All rooms have direct access straight onto the pool and terrace areas. It is a family run business and is neither a guesthouse nor a hotel. It is somewhere in between and they pride themselves on providing you with the best attention they can to surpass your expectation for your naturist holiday with them. Your stay with them is fully inclusive, you will not need any money unless you venture out. It is worth noting that discounts are available for block/party bookings of three couples. For more information please visit the Finca Natura page on our website. The Summit Rainforest Retreat is located in the Cairns Highlands, also known as the Atherton Tablelands in Far North Queensland, Australia. Situated on the summit of an extinct volcano and commanding the highest point in Atherton, the retreat is five wonderful acres of naturist paradise. There are two types of accommodation available for your naturist holiday. There is the one bedroom apartment which is perfect for singles, couples or families. Alternatively, you have the luxurious Summit Rainforest Retreat which can be arranged into a three, four or five bedroom holiday house sleeping up to sixteen people. Whichever accommodation you choose, you are able to enjoy the heated pool and spa on the huge entertainment deck, which includes a poolside TV, BBQ, refrigerator, bar 180 degree views and open fireplace. It is certainly worth checking the special discount rates should you stay for more than six nights. Visit our Summit Rainforest Retreat page to find out more about this fantastic naturist holiday. The stunning Villa Dias is situated in grounds of two acres, with amazing views of the surrounding countryside down to the nearby coast. If it is seclusion you are looking for, then you have just found it. It is reached by a two minute drive on a dirt track and is totally private. Despite its perceived remoteness, it is just a few minutes drive away from the village of Spatia, with mini markets and tavernas, and is in the Livathos region of southern Kefalonia. The villa is conveniently located within easy reach of lovely sandy beaches. It is just a twenty minute drive from Argostoli, the island's capital, and the airport. Villa Dias consists of four air conditioned bedrooms, all of which have ensuite shower and toilet facilities. 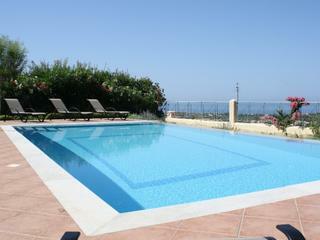 The villa has a wonderful infinity swimming pool with sunbathing terrace and incredible views. There is a barbeque area for those balmy Greek evenings, or possibly a lunchtime followed by a lazy afternoon by the pool. 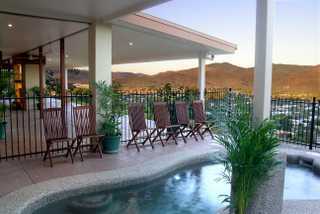 To cap it all, why not have a sundowner in the Jacuzzi which is in one corner of the pool. Find out more about booking a holiday at Villa Dias. 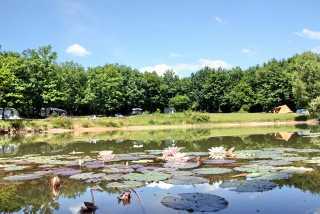 This is the swimming pool exception in this newsletter because we thought what a beautiful photograph of Creuse Nature. They also have a lovely swimming pool. Creuse Nature is about two and a half hours from where we live in Charente. It is certainly on our 2014 wish list to go and visit Els and Reinier again this year. If it is absolute peace and relaxation in the French countryside that you crave, you need look no further than Creuse Nature. You may remember that we mentioned last year of the addition of Glamping Safari tents. These are huge tents with all comforts, even a bath. They are 66m² in area and are situated on some of the nicest places on the site. We can vouch for that as they are in the area that we always used to choose to camp. Els informs us that there is still some availability but you had better be fairly quick because they will book up. Please visit the Creuse Nature page for more details. Apartment 92 at Costa Natura Naturist Resort in Espona, Spain is situated in a wonderful position, and can sleep up to four people. Just one hundred metres from the naturist beach, the south facing apartment has two sun terraces, both of which have fantastic sea views. On most days it is possible to see along the Mediterranean coastline to Gibraltar and Africa beyond. Costa Natura is so relaxing, and looks like a typical white washed Andalucian village. This reflects the white mountain villages it is possible to find all over southern Spain, and gives the resort great charm. Being a family orientated naturist resort there is a large 22 metre solar heated community pool and also a smaller children's pool. These are situated within very easy reach of the apartment. The apartment itself is equipped with every facility necessary for a wonderful holiday. Click here for more details of Apartment 92 at Costa Natura. Finally, we would like to thank all the advertisers, contributors and visitors to our website for helping us to achieve the recent Alexa Global Ranking of 794,621, which puts us in the top 0.5% of websites visited. Not only does this motivate us to keep adding, what we hope, is interesting information to the Naturist Holiday Guide, but it also shows what a growing interest there is in naturism. Thank you, once again, and please keep in touch with us!